Be on time and dress for your weather with this skinnable clock that gives you precise time, alarms to important events, informs about the current weather conditions, and integrates seamlessly into Windows Task Bar. Weather Clock replaces the standard Windows system clock and offers a number of enhancements for people who like neat solutions. Dripping wet? Caught a cold? Afraid that you will? Dress for Your Weather. A digital thermometer, a weather forecast station, and a dress guide, all in one convenient package. Weather Clock keeps you updated on the weather at your location, so you always know what to wear. 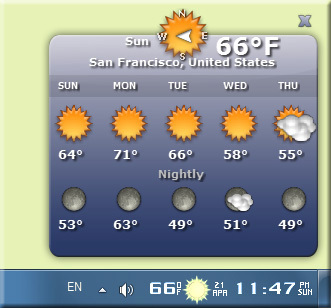 If you go mobile from time to time, desktop weather goes mobile with you: just change the location to get the weather for where you are at the moment. Had enough of being late? Feel like you are wasting time? Things are getting out of control? Be on Time, Be in Control. The time on your computer will always be precise with Weather Clock's synch features, but more importantly, you can organize yourself and get things done by setting alarms for certain events, appointments, and tasks. Use the built-in desktop calendar to track appointments or get in synch with your friends and colleagues using the time zones tracking feature. You can now go to bed without stopping to shut down your computer or you can depend on Weather Clock to shut down the computer when it's time to go to bed. Customize the look of the clock display and the floating desktop calendar widget using a wide selection of skins. Turn your computer into a powerfull alarm clock! Wake up to a beep or music your choise. You will feel much better when you be reminded by listening to your favorite music and also feel confident in what needs to be done! This alarm clock will definitely set the mood for you days!